The first beta of Firefox 2.0, codenamed Bon Echo, is now available. 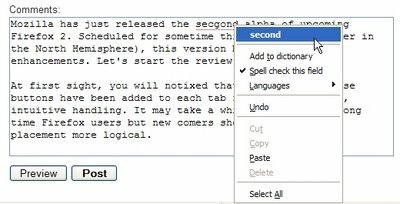 The most interesting features of the new version are: inline spell checking - Firefox underlines the errors and suggests alternatives, the new search bar integrates Google Suggest (and also a similar feature for Yahoo) and lets you manage search engines much easier, session restore - if the browser crashes, it will open the previous tabs when you restart. Firefox 2.0 gathers extensions and themes under one name: add-ons, so it's easier to manage and update them. The new version includes an anti-phishing feature previously available in Google Toolbar, although by default Firefox uses a local list of malicious sites and doesn't connect to Google. Now it's easier to subscribe to feeds by clicking on the orange icon from the address bar. You also have the option to subscribe using a different feed reader (the options are: a desktop feed reader like Outlook, IGoogle, MyYahoo and Bloglines). If you use another online feed reader, open a new tab, type about:config and enter "browser.content" in the Filter box. Now you can replace Bloglines with your feed reader: double-click on the title and on the URL and enter the new values. For NewsGator, you should enter: http://www.newsgator.com/ngs/subscriber/subext.aspx?url=%s . If you close some tabs by mistake, you can go to History / Recently Closed Tabs and choose the tab you want to reopen. Another option is to right-click on a tab and select "Undo Close Tab". * you don't have to uninstall your current version of Firefox. The application installs itself in a different directory and you won't lose the stable version. It seems that Firefox 2 incorporates all the features I have under Firefox 1.5 through the use of extensions. I've had inline spell checking for months, thanks to the development version of the Spellbound extension. Earlier today I was engaged in a discussion about two different aspects of the browser wars with respect to Firefox. The conclusion that was reached was that FF is the best browser with selected extensions installed. However, the extensions are what make it "unfriendly" to most "normals." As such, it will have a struggle for each percent of market share that it gains. The gradual incorporation of features into the main program is the *right* thing to do. However, it must be done carefully to prevent bloat ala any "full-install" OS installation. It's a fine line to walk that the folks within the FF dev team are walking well. Does Firefox 2.0 Beta work with Windows 98? Yes, Firefox supports Windows 98. Study the system requirements. Firefox 3.0, that will be launched next year, will support only Windows 2000/XP/2003/Vista (and of course Mac + Linux).